Update: Added HD (720p) version below for comparison. Above is a sample movie I created 100% on the new iPhone 4. I used the iPhone 4’s built in front and rear facing cameras to capture stills and video. I used Apple’s new iMovie for iPhone App to edit and assemble the clips and add the transitions, titles, and audio. Finally the video was exported to the Camera Roll and uploaded directly to YouTube via the device. The whole project took about 2 hours or so to complete and was actually quite simple to put together. As you can see the final results are pretty good, but there is room for improvement. First. I don’t have steady hands and I think a tripod or something to stabilize the phone as I shot the video would have been a great help. As for the audio, I used the built-in “theme” track. In the app there was no indication of the length of the track. When enabled it simply created a green “tack line” under my video timeline and the line extended the full length of my video project. I naturally assumed it was long enough or would loop to cover my whole project. When previewing in edit mode in the app it even played the audio throughout the project. It was only after export that I discovered the track simply faded out at the end, around a minute or so in. There is no option to loop the track and you can only have one such “background” track per project. You can however also include the recorded audio from each clip over the background audio if you choose and it will even auto-duck the background track. Finally, the video exported to the Camera Roll on the iPhone is output at 720p (1280 x 720). Unfortunately, uploading to YouTube directly from the iPhone only yields a maximum resolution of 568 x 320. I assume this is why the YouTube above maxes out at 360p. Even so I think that all of this can be done on a phone. Just so you can get a comparison, I do plan to upload a 720p version polished up in iMovie on my Mac so you can see what the iPhone is fully capable of. Stay tuned. Here is the 720p version as promised. It is still exactly the same version produced and exported entirely on the iPhone. The only change is a new music track I added in iMovie on the Mac since the iPhone version couldn’t be looped. 10:04:20.5. I would say that is meeting Apple’s stated tech specs. I did have Wi-Fi on the whole time and I did a variety of tasks from reading books and watching video to surfing the web and reading RSS feeds. As a bonus I also wrote this blog post using the WordPress app for iPad. Typing on the on-screen keyboard is amazingly good (if not a little messy). So, in addition to the amazing battery life I’m finding that the iPad is also a very capable alternative to my Macbook Pro when I want a more agile and lighter weight alternative. And oh, in case your wondering about charging time. 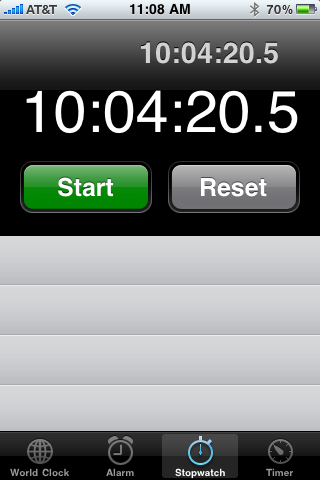 Using the included 10W USB Power Adapter I was able to go from 0 to 100% charge in approximately 4 hours. Nova Media today announced introduction of a new version of their FoneLink app, version 2.0, which gives Mac users a really nice tool to keep their mobile phone in sync with contacts, calendar, and media—in ways that iSync can’t. If you know how iTunes lets you sync with your iPhone or iPod, this is the closest thing to it. Today is the last day in My Oovoo Day, which might more accurately been named My Oovoo Couple of Weeks. What is Oovoo? Does the post office deliver mail on My Oovoo Day? 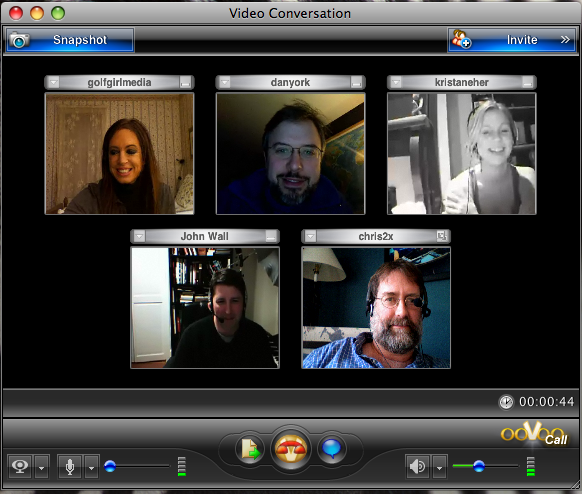 Oovoo is a new video chatting application that is available for Mac and Windows. It allows up to 6 people to have a video chat at the same time in a display that has been compared (by people like me who watched too much TV in their formative years) to the opening credits of Brady Bunch or the grid for Hollywood Squares. If you’re in the market for a personal finance application, Liquid Ledger should be at the top of your list. While it does take time to get used to the organization and interface of the program, it gets the job done smoothly once you get going. At first setting up all your various accounts can get annoying, but the ability to overview all of your funds and accounts at a glance is well worth the time spent. Liquid Ledger allows you to import/export multiple file times, including Quicken’s Interchange Format and more generic options to make compatibility a strong point. As mentioned earlier there is a great overview feature, included with that is the ability to print out several types of financial report and graphs. In terms of finance there really isn’t much that Liquid Ledger can’t do, but the real question is if you will be able to make use of the feature set. Liquid Ledger is definitely a great application for those who do a lot of in-depth personal or business finance, but if you’re looking for a more minimal, simplistic application see Cha-Ching, to be featured next week. The developers at Modeless Software, Inc. have made a 60-Day Trial available for free with minimal nagging that I’d encourage anyone to give a try. You can find it at liquidledger.com. For those who have hacked their iPhone, Erica Sudun has put together another little gem of an app called Listen, that lets your iPhone identify songs that it hears playing on your radio, on the TV, or where ever. Listen is in beta, and the version Iâ€™m using is â€œbeta 06â€ which has a nicer push-button interface than initial releases, and some more useful functionality. Because itâ€™s beta, I should say use it at your own riskâ€”but that pretty much goes for any app youâ€™ve installed on your hacked iPhone or iPod touch. If you havenâ€™t hacked your iPhone yet, directions to help you can be found here. You can download the Listen app from the Multimedia section of the iPhone Installer app, simply listed as â€œListenâ€. After you do so, itâ€™s going to be listen in your Springboard home screen with a purple icon. To start it, just tap on the icon. 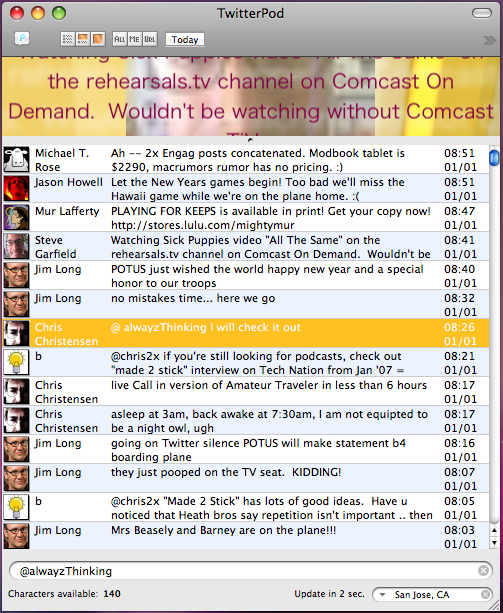 If like me, you have become addicted to Twitter, then you should check out the TwitterPod application for the Mac. If you have been living in a cave, twitter is a web based server that allows people to “micro blog”. You can enter any text that will fit in a 140 character limit. Twitter updates (or tweets) can also be delivered to your cell phone if you so desire. People twitter about blog articles they have written, what they have had for breakfast or words of wisdom as long as it fits in 140 characters. Many podcasters and bloggers have started to use twitter because you can send updates to a set of people who follow you but follow the updates, potentially, of a completely different set of people. Adam twitters at maccast (sometimes) and I (my podcast is the Amateur Traveler) twitter at chris2x. acedtect Happy Arbitrary Roman-derived change of annual enumeration. leolaporte Turkish coffee and a flight to Aswan where we meet the Sun Boat IV. Sarkozy and Blair are in town, snarling the traffic. chris2x just a thought, when Clark Kent gets new frames, does anyone recognize him? scottsimpson For the record, a certain part of my anatomy has also been compared to a baby’s arm: my arm. CaliLewis “When we honor the potato, we honor ourselves.” Just heard it on NPR. And if those literary gems make you more interested in Twitter than as a Mac user one program that I would recommend is TwitterPad which has a clean interface and growl notification. It also highlights the last post you read (you can read URLs posted in a pop out panel) so it makes it easy to tell what posts are new. MobileCast is a native iPhone app, not a web app. So, at least until Apple puts out their SDK, you’re going to need to jailbreak your iPhone / iPod Touch to install this app. If you’re running a recent version of the Installer.app, MobileCast can be found in the Multimedia category. Tap to install it, like any other app. After you exit the installer, MobileCast’s icon should be located on your Springboard (the home app menu).